PeopleService was awarded its first contract with Humboldt, Iowa in 1996. That was for managing the wastewater system, and it was excellent timing because the system was starting to show signs of age. 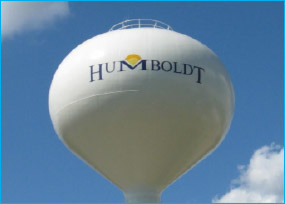 Today, PeopleService manages Humboldt’s water treatment plant, wastewater plant, collections and distribution system. Together with Humboldt, we have developed and managed plans to counter the effects of aging on these facilities to keep them running smoothly and efficiently. As with all partners, we start by inventorying assets and instituting the programs outlined above as we know they should be run. What’s really smart on the part of Humboldt is they budget every year for portions of sewers to be re-lined, hydrants to be fixed, manholes to be rehabbed and distribution valves to be replaced. This slow, steady maintenance makes a steady and impactful difference for the city. As new construction increases in the community we see less impact on the water/wastewater facilities and increased insurance ratings. Steve Robinette, the PeopleService Region Manager in charge of servicing Humboldt, has this to add. “We connect the dots from water and wastewater maintenance and management to economic development. A lot of time it comes down to resources (budgeting money) to feel the net impact of that connection, but this is the approach we try to take in all of the communities we work in. When it can be done, it can mean really great things for the economy overall. To learn more about what we do for Humboldt, and how that translates to what we can do for you, contact us today.